Just a few minutes’ from the centre of Palma, the 4-star Hotel Roc Illeta is a modern aparthotel, right by the beach. Based around 4 buildings, the Roc Illetas Playa offers direct access to the sea, indoor and outdoor pools with sea views, bike rental, a bar and a restaurant offering both local and international cuisines. Comfortable, but contemporary, the hotel’s accommodations offer terraces or balconies, flat-screen TVs with international channels, minibars and free wi-fi. Sit out on one of the seafront terraces with a cool drink, and watch the sun set across the Mediterranean Sea from the gorgeous 4-star Europe Playa Marina hotel. Each individually decorated room, fitted with minibar and air conditioning, has its own unique Mediterranean style, with warm colours and sea views. Enjoy a range of cuisines at the hotel buffet before heading to the bar for a refreshing cocktail or catching up on emails with the hotel wi-fi. Located on a small peninsula on the Costa d'en Blanes, in front of the sea and with direct access to two small coves with crystal-clear water. It has 5 convention halls, large gardens and pools, a varied gastronomic offer and 5 golf courses in the surrounding area. 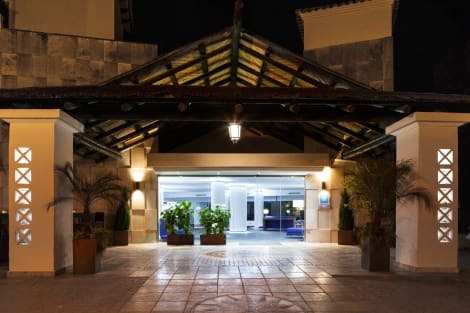 Its privileged location and its complete facilities make it the ideal hotel for accommodation during your stay on Mallorca, whether for business or pleasure. The Punta Negra has been renovated. As the hotel is family-run, the owners pride themselves on the personal service they provide and are always on hand. The property itself has lots of character, with wooden beams, exposed stone and the added personal touches of the owner's collection of furnishings. From reception, take the lift or make the 200 steps across the road down to the lush sub-tropical garden, where waterfalls splash peacefully into the swimming pools and the crystal clear waters of the small, sandy beach invite you for a swim. The water's edge is also the setting for a bar and restaurant where, during the summer months, guests can enjoy breakfast, lunch or a romantic dinner. In the evenings, sample exotic cocktails on the terrace as the sun goes down or relax in the hotel's two spacious lounges, which are located next to the main restaurant. For a spot of pampering, the new wellness centre offers relaxing massages, saunas and a wide choice of therapeutic and beauty treatments, as well as an outside Jacuzzi. For the more active, the hotel also provides 2 tennis courts, squash court, gym and mini-golf. 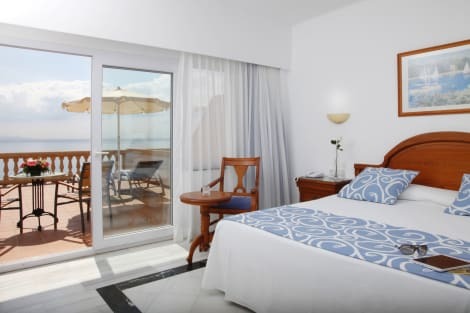 Offering access to white sands, opal blue waters and picturesque coves, and only a short drive from Palma de Mallorca, Illetas Hotels are a fantastic destination if you're looking for a place within reach of both quiet beaches and vibrant city living. Set on a steep slope overlooking the sea, the resort of Illetas boasts spectacular views of the coastline. Getting around the small town itself is easy enough on foot, with all the main attractions within walking distance. Bikes can be rented from plenty of places, although it might be a little hard to get your bike up some of the steeper areas of the town. When you get to the beach you might find it hard to pull yourself away, so be sure to pack a good book and plenty of sun cream. Hop on a bus and within minutes you'll be in the centre of Palma de Mallorca, the capital of the Balearic Islands. Here you'll find an enormous range of things to do and see. Dip into the area's rich historical culture with a visit to the impressive 14th-century gothic Bellver Castle to the north of the city, or make a pilgrimage to the striking Cathedral of Santa Maria of Palma. Illetas itself has a limited range of shops to choose from although there's everything here you could need for a day trip to the beach. If you're looking for something a little more luxurious, Playa de Palma is a great place to catch up on some retail therapy. The city encompasses everything from small boutique shops to large department stores, as well as regular marketplaces selling clothes and food. The area is famed for its seafood and there's a selection of cosy restaurants along the beachfront of Illetas. Again, there's enough to keep you occupied if you're fine with something low-key but if you want an extravagant night out, Playa de Palma plays host to a staggering selection of restaurants, bars and nightclubs. Dance the night away in the city and then catch a taxi home to Illetas to unwind in peace and quiet.